Changing student needs are creating new ways for social workers to do what they do best. Changes in America's colleges and universities have created opportunities for social workers to pursue social justice in higher education while addressing the schools' and students' emerging needs. Institutions of higher education today aim to survive in the face of fewer high school graduates and larger numbers of college students who, for many reasons, are at risk of not completing their degrees. Even as income inequality grows, tuition and fees in higher education rise, while financial aid fails to keep pace (Seltzer, 2017). Government funding for public higher education has dropped, and students are incurring more educational debt (Mitchell et al, 2016). These trends exacerbate societal racism, ableism, discrimination, income inequality, and other forms of oppression. Consider a first-generation college freshman, Ivelisse, who works 20 hours a week as a waitress to help support her family. She also takes care of two younger siblings while her parents work more than full time in minimum-wage jobs. Fleeing hurricane devastation, Ivelisse's aunt and uncle leave Puerto Rico to join the household while they look for work. At the same time, Ivelisse's mom is injured and loses her job. Ivelisse then must work 40 hours per week, struggles to get to classes, and has no time to do reading assignments or papers. Her car dies, and she spends three hours a day taking busses to school and work. She's anxious, exhausted, and stressed. The college's bureaucracy and terminology also bewilder her. What's a registrar, a bursar, a provost? What does academic probation mean? Is it permissible to ask a professor for an extension on a paper? If an extension means losing points on one's grade, how will that affect her overall grade point average? Is it even possible for a student to make up a missed class? Ivelisse needs a lot more than academic advising, emotional support, or counseling. She needs information, money, reliable transportation, health care for her mom, housing and employment for her uncle and aunt, and child care for her younger siblings. She needs a guide to help her navigate complex bureaucracies on and off campus. But Ivelisse doesn't know where to turn, whom to ask, or even what to ask for. Social workers are trained to recognize and respond to students such as Ivelisse. As a result of a growing need, some campuses are beginning to provide social work services that reach beyond their usual counseling or advising offices. The wide range of special needs among today's college students requires more complex multidimensional, carefully coordinated, assertive help, without which students drop out. Income inequality is pronounced; 95% of income growth in the United States goes to just 1% of the population (Sommeiller & Price, 2015), and a college degree is often needed in order to make a living wage (Carnevale, Jayasundera, & Gulish, 2016). A college degree offers a toehold on the socioeconomic ladder. The U.S. Department of Education reports that in 2015 a college graduate's mean annual earnings were $50,000, compared with a high school graduate's $30,500. Since students of color and students from low-income households face special challenges completing college, academic success is a social justice issue. When students fall short in their ability to pay for their education, the income equity gap grows. Even college graduates today often have difficulty earning enough money to afford a middle class lifestyle; wages are stagnant and affordable housing supplies diminishing. Recognizing how crucial it is to earn a college diploma, traditionally disempowered populations are entering higher education at increasing rates (U.S. Department of Education, 2016). This includes students who have mental health challenges and learning disabilities/differences and who are immigrants, refugees, undocumented, of color, English language learners, and from economically disadvantaged backgrounds and communities. Each of these populations at risk faces unique challenges adjusting to and thriving in college (O'Keefe, 2013). They need well-informed, highly individualized assessments and intervention plans with sustained supportive attention and advocacy to help them complete college. Many challenges confront students at risk. For example, a student of color may sense, often accurately, that people are thinking, "She's only here because of affirmative action. She's not really college material." That student may feel dismissed, stigmatized, and objectified, and work under intense pressure to show that she's as competent as her classmates. The pressure causes distress that can affect learning and can lead the student to avoid asking for needed help because she fears reinforcing negative stereotypes of inadequacy. Undocumented immigrant students may live in fear of discovery and deportation for themselves and/or family members. As a result, they remain silent, trying not to draw attention to themselves, afraid to ask for academic or other needed supports. A student who has endured trauma may be triggered into a fight, flight, or freeze state, when, for example, a faculty member sternly imposes penalties for late papers or when the student gets a verification notice from the college financial aid officer. Immigrant students may be stunned when accused of plagiarism, which may be a foreign concept. When the student gets in trouble for failing to cite a reference properly, she may be perplexed, bewildered, and afraid. An English language learner may be highly articulate in his native tongue but may struggle to write papers clearly and grammatically correct in English. He feels demoralized and discouraged by corrective feedback on a paper, and the resulting anxiety makes it hard to learn, leading the student to shut down. Students from a low socioeconomic background may have to share a car with siblings or parents, making reliable access to transportation elusive. Students who use public transportation to get to school and work may face excessively long commute times. Inclement weather, a required extra shift at work, a sick child, or a full bus that keeps travelling past their bus stop may make them miss class or arrive late. Students who successfully completed high school with learning disabilities and mental health challenges may find themselves cast adrift in college, where services more readily available in high school now require self-disclosure and active self-advocacy. Students who once would not complete high school because of mental health or learning differences are now able to enter college, thanks to federal legislation requiring reasonable accommodations and access to special education services in grades K through 12. Accessing those services in college may be another matter entirely. Youths who aged out of the foster care system, with minimal or no family or state support, may be unable to find housing during school breaks when dorms are closed and must rely on friends who allow them to "couch surf" through holidays and summer sessions. When friends are unavailable, the student is homeless. A growing number of students experience homelessness (U.S. Department of Housing and Urban Development, 2015). Many college students today also face food insecurity, utility shut offs, or extreme emotional duress stemming from intimate partner violence, bullying, family issues, or other life events that disrupt their progress toward a college degree. Students from economically disadvantaged backgrounds may not have had the nurturing academic supports that students from privileged schools have enjoyed. A student from an affluent public or private school may have had ample access to tutors and academically enriching extracurricular activities, and may have learned that it's desirable and permissible to approach faculty to request help. The less privileged college student might not know these rules of the road. Even students from privileged backgrounds are facing acute stressors in numbers not seen before (Pinder-Amaker & Bell, 2012). Estimates are that 1 in 3 of today's college and university undergraduate students experiences disabling depression and 1 in 10 reports suicidality (Hunt & Eisenberg, 2010). In short, the number of college and university students facing significant life stressors that can impede graduation is growing. Students in at-risk groups have lower graduation rates than others. All the above stressors consume time and the physical and mental energy needed to pursue graduation. Many students find that they are unable to do any readings at all, and they might merely skim important readings or write papers late at night when they can barely think because they're exhausted from working full time while carrying family responsibilities. Full-time work while in school is their only way to pay for college. Mental energy must go first toward survival, not academics. Ironically and sadly, the students in this predicament may be highly competent and committed to completing a college education, yet least able to achieve that goal. They disappear from school, with significant debt that further bogs them down, preventing them from returning. In fact, in 2013 an estimated 8 million Americans started college and did not finish (O'Keefe, 2013). School social work is an established service in K through 12 schools but is in its infancy in higher education. The school social worker's role includes many components, including crisis intervention; serving as a liaison between parents and teachers; intervening in classrooms to analyze student needs and implement behavior change plans; running life skills psychoeducation groups; mediating disputes among students or among students, faculty, and parents; completing psychosocial assessments for the purpose of designing individual education plans in synch with federal regulations; helping teachers understand students' mental health and psychosocial stressors; providing emotional support to stressed out teachers; linking students and their families with community resources; organizing parents or teachers to advocate for changes in school policies; and intervening at the city and state levels to change laws that affect students. Clearly, part of implementing social work's social justice mission involves expanding the school social work model into higher education so that students from disenfranchised, disempowered populations or who live with challenging circumstances have ready access to a full complement of academic and socio-emotional supports to promote successful graduation. Some campuses are expanding the support services available to students, such as comprehensive assessment, case management, advocacy, facilitation, and mediation. Social workers, traditionally employed as mental health providers in higher education counseling centers, can serve expanded roles that enhance student success. While colleges and universities typically offer a wide array of student support services, each campus organizes that array differently, and often programs function as silos, with insufficient communication and coordination among them. What services, if any, a student accesses may be by chance of whomever the student's academic advisor is, what classmates the student happens to encounter in the dining hall, how comfortable the student is asking for help, what the person the student asks happens to know about the campus, and so forth. 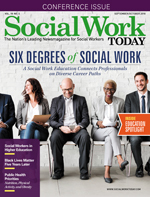 A social work perspective, with foci on biopsychosocial spiritual assessment, sensitivity to diversity and oppression, and pursuing organizational and policy changes to promote social justice, can help higher education administrators build a well-coordinated system of care. An array of various campus support offices, such as disability services, the counseling center, campus health center, and tutoring, can be carefully coordinated to create a well-articulated, multidisciplinary approach that wraps around each student at risk in an individualized action plan. These services can enhance student retention, thus improving tuition revenues for the host institutions. In the long run, the services may end up paying for themselves. Professional social workers are trained to think in these terms and are able to provide multifaceted case management. Social workers also are trained to examine college policies and procedures in order to identify invisible but powerful barriers that hinder students from accessing help they need in order to graduate. In addition to providing crisis intervention, mental health care, and supportive counseling, social workers are trained to conduct needs assessments, design and implement programs, and monitor program outcomes. They can help empower students on campus to organize themselves as their own advocates, and work with campus and larger community organizations to create a well-articulated continuum of services that links on-campus and off-campus services. Schlossberg (1989) notes that "mattering" is important for academic success; research shows that students who feel that their needs and goals matter to school personnel are more likely to graduate (Rayle & Chung, 2007). When college and university students face life and financial stressors that jeopardize graduation and the help they need is not readily available on campus, they are less likely to feel that they matter to their schools. Social work interventions on campus can help because social workers are trained in engagement, empowerment, and motivational interviewing strategies that enhance consumer voice and choice. Bringing a social work perspective of this sort into higher education is a new vision of how best to help students at risk to succeed. "There is ample evidence that being successful in college requires more than the ability to master college-level academic skills" (Karp, 2011, p. 1). Navigating complex bureaucracies and addressing issues beyond the classroom are key. • Services are available to any student who requests them to avoid stigma and restrictive eligibility criteria. Services are structured to nimbly provide the necessary level of support, more at times of transition and less when things are going well. • Each student has their own case manager, who forms an ongoing collaborative relationship that stays with the student throughout the college experience. The case manager goes beyond merely linking the student with resources, and becomes a listening ear; a consistently available, reliable consultant in problem solving; and an advocate within and outside of campus as needed. • Intervention is multifaceted, multimodal, and individualized to the student's unique needs. • Crisis intervention is available. • Focus and frequency of contact reflects the student's voice and choice. The student's needs, not the program's design, dictate the services the student receives and when the student receives them. • Assessment of each student's needs focuses on strengths, and uses a trauma-informed biopsychosocial spiritual approach that is sensitive to dynamics of diversity and oppression. • Program evaluation research is done to track each student's progress toward their goals. This, as well as evaluation of overall program outcomes, is built into the program's design. For example, each student creates an eco-map that is used not only for assessment and intervention but also to track changes in the student's supports and needs. • Where services are provided, there is space where students can just drop in to visit with one another in a safe, comfortable spot and where meals and snacks are available free of charge to help build students' natural support system and sense of community and belonging. • The program works to coordinate a seamless continuum of on- and off-campus services to meet students' needs. Coalitions with community agencies are built. • Services are funded via multiple sources, including third-party payers and Pell grants, so that the college or university does not have to cover costs with tuition increases. Rethinking how higher education can support student success is a tall order that requires stepping outside of administrators' and faculty members' traditional roles and comfort zones. Fortunately, some institutions of higher education are taking a more comprehensive school social work approach, opening new avenues for both students and social workers. Social work services on campus can help bridge the chasm between dreams and realities that confront many students. A comprehensive, holistic, wrap-around approach, grounded in the NASW Code of Ethics' emphasis on social justice, can ease the stressors on students such as Ivelisse, amplifying her support system so she can focus her energies on academic success and achieve graduation. — Christiane Petrin Lambert, MA, MSW, LICSW, currently works in community clinical practice, teaches as adjunct faculty at Rhode Island College (RIC), and served as founding director of Learning for Life at RIC, an application of social work in a college setting. Carnevale, A. P., Jayasundera, T., & Gulish, A. (2016). America's Divided Recovery. Washington, DC: Georgetown University Center on Education and the Workforce. Retrieved from https://cew-7632.kxcdn.com/wp-content/uploads/Americas-Divided-Recovery-web.pdf. Karp, M. (2011). Toward a new understanding of non-academic student support: Four mechanisms encouraging positive student outcomes in the community college. Community College Research Center, 28, 1-33. Mitchell, M., Leachman, M., & Masterson, K. (2016). Funding Down, Tuition Up. Center on Budget and Policy Priorities. Retrieved from https://www.cbpp.org/research/state-budget-and-tax/funding-down-tuition-up. O'Keefe, P. (2013). A sense of belonging: Improving student retention. College Student Journal, 47(4), 605-613. Pinder-Amaker, S., & Bell, C. (2012). A bioecological systems approach for navigating the college mental health crisis. Harvard Review of Psychiatry, 20(4), 174-188. Rayle, A. D., & Chung, K. Y. (2007). Revisiting first-year college students' mattering: Social support, academic stress, and the mattering experience. Journal of College Student Retention: Research, Theory & Practice, 9(1), 21-37. Seltzer, R. (2017). Tuition and fees continue to rise. Inside Higher Ed. Retrieved from https://www.insidehighered.com/news/2017/10/25/tuition-and-fees-still-rising-faster-aid-college-board-report-shows. Schlossberg, N. K. (1989). Marginality and mattering: Key issues in building community. New Directions for Student Services, 1989(48), 5-15. Sommeiller, E., & Price, M. (2015). The Increasingly Unequal States of America: Income Inequality by State, 1917 to 2012. Washington, DC: Economic Policy Institute. Retrieved from http://www.epi.org/publication/income-inequality-by-state-1917-to-2012/. U.S. Department of Education, National Center for Education Statistics. (2016). Digest of Education Statistics, 2015 (NCES 2016-014), Chapter 3. Retrieved from https://nces.ed.gov/fastfacts/display.asp?id=98. U.S. Department of Housing and Urban Development, Office of Policy Development and Research. (2015). Barriers to success: Housing insecurity for U. S. college students. Insights Into Housing and Community Development Policy. Retrieved from https://www.huduser.gov/portal/periodicals/insight/insight_2.pdf.